With the protocols and time constraints of our ED environment, it is fairly easy to fall into the trap of imaging prior to examining our orthopedic patients. 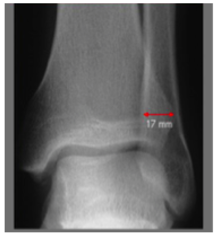 This may result in missed injuries, as we tend to base our diagnosis on the X-ray, rather than the patient assessment. In today’s post, we will review relatively common but frequently missed lower extremity orthopedic injuries including a general approach, focused assessment, and management of these injuries. Seroyer, et al. Management of the acute knee dislocation: the Pittsburgh experience. Injury. 2008;39:710–718. Medina, et al. Vascular and neve injury after knee dislocation: A sytematic review. Clin Ortho Relat Res. 2014;472:2621-2629. Natsuhara, et al. What is the frequency of vascular injury after knee dislocation. Clin Orthop Relat Res. 2014;472:2615–2620. Lachman, et al. Traumatic knee dislocatons: Evaluation, management, and surgical treatment. Orthop Clin N Am. 2015; 46:479-493. The patellar tendon is the second strongest tendon in the human body, requiring a force of ~17.5 x body weight to rupture. Risk of re-rupture is high! The lower leg is the most common location of acute extremity compartment syndrome, with the anterior and lateral compartments more frequently affected. Von Keudell AG, Weaver M, Appleton PT, Bae DS, Syer GSM, Jupiter JB, Vrahas MS. Emergency surgery 3: Diagnosis and treatment of acute extremity compartment syndrome. The Lancet. 2015; 286: 1299-1310. Tintinalli, et al. (2016). Emergency medicine: A comprehensive study guide (7th ed.) (p 1866). New York: McGraw-Hill, Medical Pub. Division. Cross, C. Reducing missed orthopedic injuries in the ER. CMAJ January 7, 2014 186:E18; published ahead of print December 9, 2013, doi:10.1503/cmaj.109-4674. Seroyer ST, Musahl V, Harner CD. Management of the acute knee dislocation: the Pittsburgh experience. Injury. 2008;39:710–718. Hegyes MS, Richardson MW, Miller MD. Knee dislocation. Complications of nonoperative and operative management. Clin Sports Med. 2000:19:519-43. Natsuhara, K.M., Yeranosian, M.G., Cohen, J.R. et al, What is the frequency of vascular injury after knee dislocation. Clin Orthop Relat Res. 2014;472:2615–2620. Medina O, Arom GA, Yeranosian MG, Petrigliano FA, McAllister DR. Vascular and neve injury after knee dislocation: A sytematic review. Clin Ortho Relat Res. 2014;472:2621-2629. Lachman JR, Rehman S, Pipitone PS. Traumatic knee dislocatons: Evaluation, management, and surgical treatment. Orthop Clin N Am. 2015; 46:479-493. 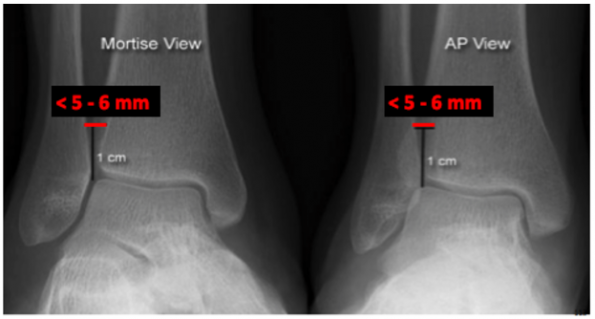 Mills WJ, Barei DP, McNair P. The value of the ankle-brachial index for diagnosing arterial injury after knee dislocation: a prospective study. J Trauma. 2004;56(6)1261-1265. Boyce RH, Singh K, Obremskey WT. 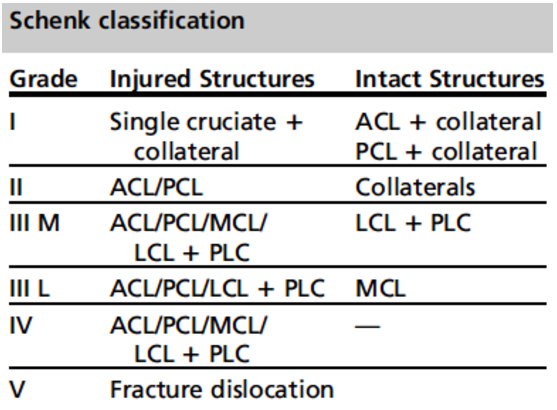 Review: Acute management of traumatic knee dislocations for the generalist. J Am Acad Orthop Surg. 2015; 23:761-768. Tarazi N, O’loughlin P, Amin A,, Koegh P. Case report: A rare case of bilateral patellar tendon ruptures: A case report and literature review. Case Rep Orthop. 2016; 2016:6912968. doi: 10.1155/2016/6912968. Epub 2016 Apr 20. Wheeless CR. 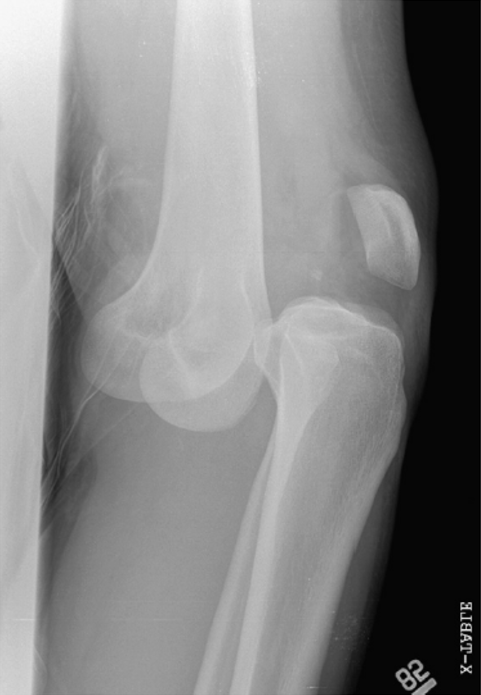 Rupture of the Quadriceps. Wheeless’ textbook of orthopaedics, February 12, 2017, http://www.wheelessonline.com/ortho/rupture_of_the_quadriceps. 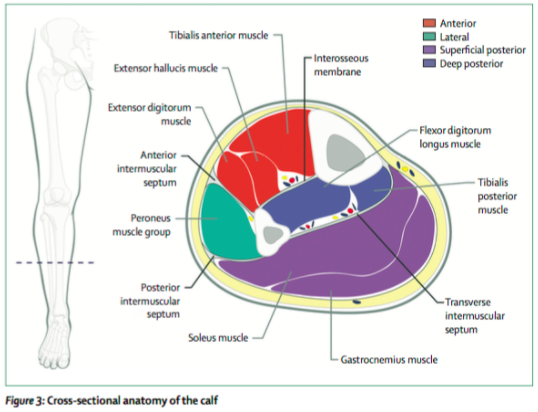 Hak DJ, Sanchez A, Trobisch P. (2010) Review Article: Quadriceps tendon injuries. Orthopedics. doi: 10.3928/01477447-20091124-20. Ng JP, Cawley DT, Beecher SM, Lee MJ, Bergin D, Shannon FJ. Focal intertendinous radiolucency: A new radiographic method for diagnosing patellar tendon ruptures. The Knee. 2016; 23: 482-486. Garner MR, Gausden E, Berkes MB, Nugyen JT, Lorich DG. Extensor mechanism injuries of the knee: Demographic characteristics and comorbidities from a review of 726 patient records. J Bone Joint Surg Am. 2015; 97:1592-6. Berg K, Peck J, Boulger C, Bahner DP. Case Report: Patellar tendon rupture: An ultrasound case report. BMJ Case Rep. 2013. doi:10.1136/bcr-2012-008189. 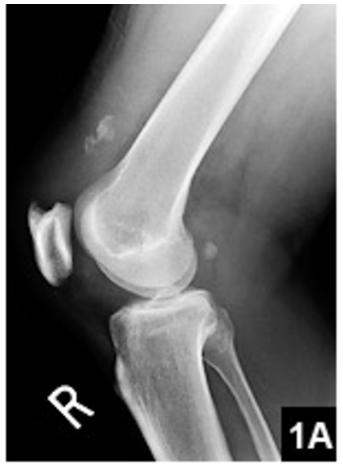 Fazal MA, Moonot P, Haddad F. Clinical Article: Radiographic features of acute patellar tendon rupture. Orthopedic Surgery. 2015;7:338-342. Swamy GN, Nanjayan SK, Yallappa S, Bishnoi A, Pickering SA. 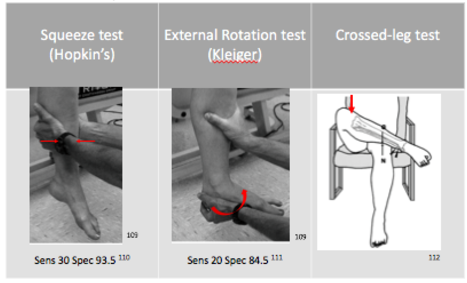 Is ultrasound diagnosis reliable in acute extensor tendon injuries of the knee? Acta Orthop Belg. 2012; 78(6) 764-70. Roberts JR, Hedges JR. (2015) Roberts and Hedges’ Clinical Procedures in Emergency Medicine (Roberts, Clinical Procedures in Emergency Medicine) (6th ed.)(p.1095). Philadelpia, PA: Elsevier/Saunders. 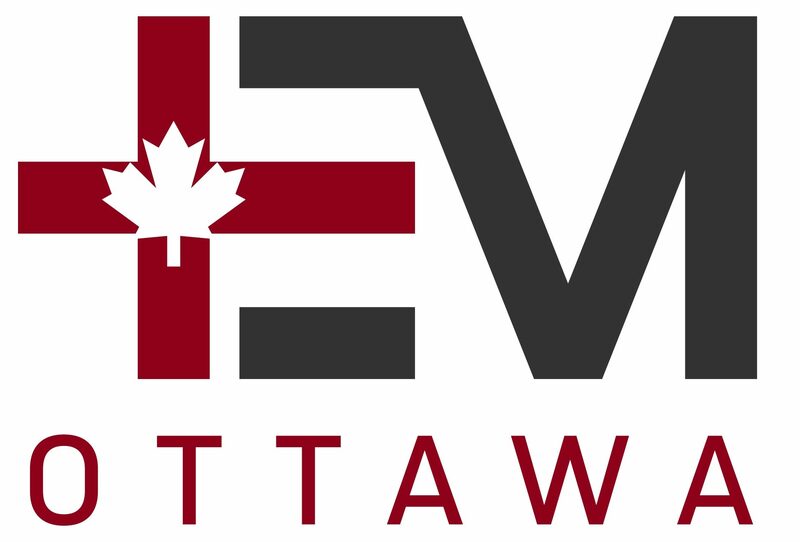 Shadgan B, Menon M, Sanders D, Berry G, Martin C, Duffy P, Stephan D, O’Brien PJ. 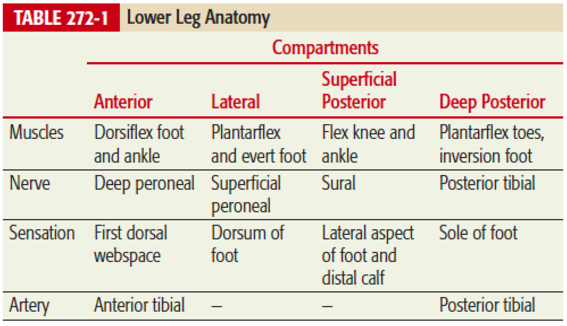 Current thinking about acute compartment syndrome of the lower extremity. Can J Surg. 2010;53(5) 329-334. Tintinalli, J. E., Kelen, G. D., & Stapczynski, J. S. (2016). Emergency medicine: A comprehensive study guide (7th ed.) (p 1866). New York: McGraw-Hill, Medical Pub. Division. Raza H, Mahaptra A. Review article: Acute compartment syndrome in orthopedics: Causes, diagnosis and management. Advances in Orthopedics. 2015. http://dx.doi.org/10.1155/2015/543412. Ulmer T. The clinical diagnosis of compartment syndrome of the lower leg: Are clinical findings predictive of the disorder? Journal of Orthopaedic Trauma. 2002; 16(8): 572-577. Schnetzke M, Vetter SY, Beisemann N, Swartman B, Grutzner PA, Franke J. Management of syndesmotic injruies: What is the evidence? World J Orthop. 2016; 7(11): 718-725. 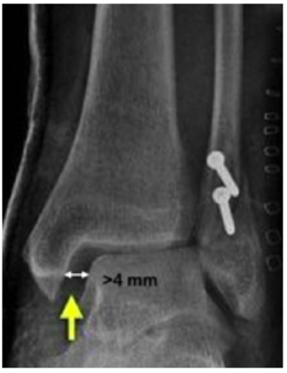 Schock HJ, Pinzur M, Manion L, Stover M. The use of gravity or manual-stress radiographs in the assessment of supination-external rotation fractures of the ankle. J Bone Joint Surg. 2007; 89: 1055-1059.